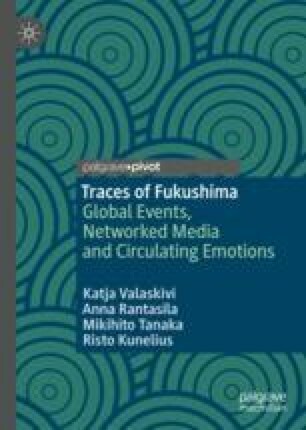 This chapter looks at the Fukushima disaster as a media event from a spatial perspective by raising the question of how social media activity constructs social distance, and in so doing conditions the dynamics of public discourse. By applying co-retweeted network analysis of retweeting in Japan during three consecutive years, the chapter shows how the ambient sense of community in Twitter feeds about Fukushima moved from an early ‘disaster utopia’ to a more acute political polarization that in the context of national nuclear politics is articulated as a core theme. Polarization of discussions in the aftermath of Fukushima, the general political landscape and the increasingly strategic use of social media lead to a mediated social geography where it is difficult for science and journalism to play a constructive role. This chapter was contributed by Researcher Daisuke Yoshinaga from Waseda University. Kurokawa, S. (2018). Comment on “individual external dose monitoring of all citizens of date city by passive dosimeter 5 to 51 months after the Fukushima NPP accident (series): II”. Journal of Radiological Protection. https://arxiv.org/abs/1812.11453v1 [physics.med-ph] 30 Dec 2018. Wile, J. L. (2013). A surprising study of people living near Fukushima. http://blog.drwile.com/a-surprising-study-of-people-living-near-fukushima/. Accessed 9 Sept 2018.